Beam: 12 ft., 6 in. The Origins: The tendency of Southern California’s fires to burn up dry brush quickly seemed to also be an appropriate name for a boat. Hence Brushfire was born. The name seemed especially appropriate to Gene Trepte, the original owner of Brushfire, who had high hopes she would be a major competitor on the water. Originally built by Gerry Driscoll and Tom Henderson, Brushfire is an Olin Stephens Sparks & Stephens, design #1952 and is considered by some to be one of the most glorious vessel designs on the ocean. Stephens, who was one of the most recognized and acclaimed boat designers, was the mastermind that created six winning vessels of America’s Cup – a record still standing today. Brushfire took two years to design and build. She is a wooden, single-planked vessel with plywood wedges inside between the ribs. Similarities to Intrepid: Brushfire shares some similarities with the Sparks & Stephens, 12-meter vessel, Intrepid. 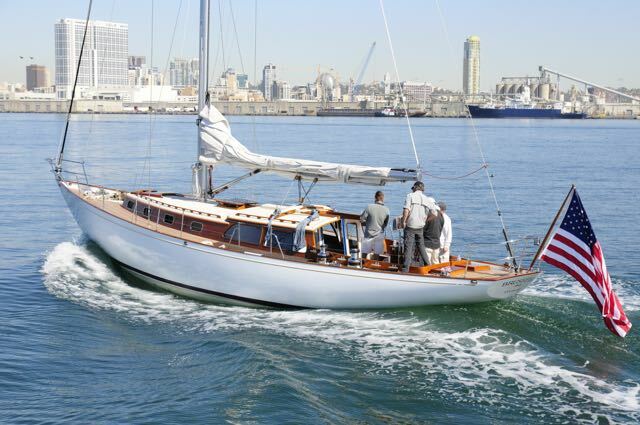 Sailed and built by Driscoll, Intrepid won America’s Cup in 1967. The underbody of Intrepid has a likeness to Brushfire’s and both have a rudder and trim tab, located at the trailing end of the keel. Complete & Total Re-fit: Ron Arnold, who oversees and manages Brushfire for the current owner, recently watched over her refit at Driscoll Boat Yard in Shelter Island, San Diego. In the total overhaul, all exterior and interior was taken down to the bare wood, repainted and re-varnished. All hardware was removed, restored or replaced as needed. New cabin port lights, butterfly hatch, forward cabin sliding hatch, water tanks, fuel tanks, holding tank, electronics, galley fridge, navigation station and removable bow anchor roller were installed. A windlass, which was not previously aboard Brushfire, was added. The main sail traveler was relocated from the cockpit to the cabin top. Last but not least, the original bronze bilge frame was polished and a clear coat was applied. The End of Brushfire’s Racing Days: In 1969 and into the early 70s, Brushfire was actively on the racing circuit, winning notable races such as the City of SF Big Boat Trophy in 1969, L.A. Yacht Club Harbor Series and King Harbor Midwinter Regatta in 1970 and Lipton Cup in 1971. The adoption of the International Offshore Rule, which resulted in the implementation of a new measurement system for racing sailboats, meant the end of the line for Brushfire’s racing days were numbered. The new rule negatively impacted Brushfire’s rating, ultimately ending her racing career. Home Base: Current owner Peter LaDow has kept Brushfire at San Diego Yacht Club.